Featured Mural - "The Powell Valley Overlook" is a tribute to area artist Lois Tracy and she is believed to be Wise's first visionary artist. She is also remembered as part of the conversation that founded the local college once Clinch Valley College and today known as UVA Wise. 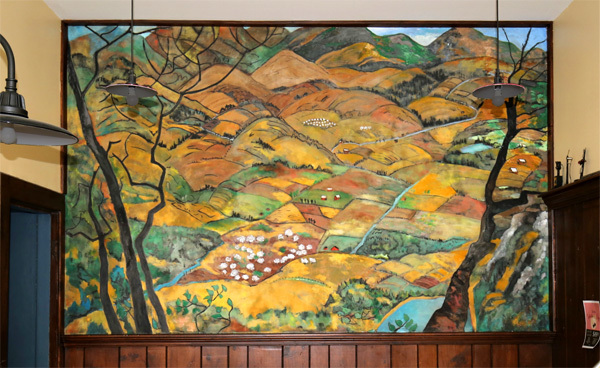 The mural "The Powell Valley Overlook" located at the Inn at Wise was painted in the late 50s or early 60s, while Lois and her husband were Innkeepers there at this time. The Powell Valley Overlook is proof that not all scenic overlooks are the same. This overlook stands high on the side of a mountain range on the main road from Norton to Big Stone Gap overlooking the lush valley below. Farms, homes, and wide open fields cover the valley floor. Day or night this is a place to visit for an amazing view. For the past 100 years, the Inn at Wise has been a landmark for Southwest Virginia residents, but in the recent past has fallen into disrepair and neglect. The Wise County Industrial Development Authority purchased the building in December 2007 and since then has done a complete restoration of the Inn at Wise to return it to it's past uniqueness. The Inn at Wise stands as a monument to the turn of the century development for timber, rail and coal industries which has made the town of Wise what it is today. The Inn at Wise is considered one of the most important pieces of a puzzle to tourism development for all of Southwest Virginia." I was born in Jackson, Michigan on December 9, 1901. By age three my favorite activity was picking up gravel and stones and watching their colors and shapes when placed in jars of water. I spent hours admiring how beautiful they looked. Even now I love rocks. They talk to me. Trees have always talked to me too. I believe my paintings came into being from my feeling one with nature. Because Mother�s health was poor, we could not spend winters in the North. When I was young, we often traveled to Florida by train with a change in Chicago. I remember when I was about six or seven, jumping off the train and running towards the Chicago Museum. There was one particular painting on the first floor to the right that was painted with very thick layers of paint. I fell in love with that thick texture. It left me with a glow of satisfaction. I decided right then and there I was going to be a painter. For the most part, we children were taught at home but we learned History by traveling to Civil War battlefields where my father paid old men to tell local stories. We learned Geography by learning the names of rivers and cities as we explored them. We had an art teacher once when I was about six, but there was no color. The only material we had was sepia, and that did not inspire me. I didn�t have another art teacher until I was a freshman at Florida State College for Women in 1920- �21. Since the College was for women only, all subjects were simply branches of Home Economics. Painting was not taught. We were not allowed to speak to any male, not even the father of a roommate. They would line us up to go to the picture show and count us off as we came out. I often felt like I was in prison. I rebelled against these attitudes towards the education of women by cutting my long wavy golden hair to a short bob. I left and entered Michigan State College soon after women were first admitted there. At Michigan, my painting teacher just let me go ahead on my own. I started using oil paints and would paint everything I saw. We were both startled by my work. To the amazement of us both, he soon informed me that I was painting just the way those wild men in Paris (Van Gogh, Cezanne, etc.) were painting. By the time the Depression came along, I was married and living in Winter Park, Florida, attending Rollins College. To help with our support, I sold pictures of palm trees, five dollars a tree. If there were three trees in the painting, it was fifteen dollars. Then I painted the buildings on Rollins campus for my 1929 yearbook. In the 30�s, in Venice, Florida, certain scenes would just cry out to be painted. When a field of cabbages asked me to paint it, I realized that cabbage leaves are just as beautiful as a field of flowers. Mostly, I painted the Florida jungles. In the morning I used to ride out to a Florida ranch on a cow pony (a rather small, tough, horse used to drive the cattle - Florida used to have the second largest number of cattle of all the States). The cowboys would leave me in a hammock and continue on to their day�s work. I would paint there all day until they would pick me up on their way back in the afternoon. I would usually have enough done on two 30x 36 or 36 x 40 canvases that I could finish them up at home. Teresa Robinette's art form is currently based on her love of Southwestern Virginia. She has been involved in the creation and restoration of over 77 murals throughout the US.